We feature a Sunday-Sunday summer rental schedule. Quick Facts: No Hidden Fees! Great Northside Central Location. Convenient to Bay Beaches, (minutes away to Cape Cod Bay Beaches, local restaurants & stores, and pubs. Easy access to Rte. 6A and Rte. 6. South Side Beaches 10 minutes away. Perfect location. Storage for your bikes in attached garage. YES you can bring your boat! We have a circular driveway for easy boat trailer access, and parking. 2 public ramps just minutes away at Sesuit Harbor. Spring: $775.00 per week. Nightly pricing available, 4 night minimum. $125.00 per night. Summer: $995.00 per week 7 night minimum. Fall: $775.00 per week. Nightly pricing available. Process is easier than VRBO makes it seem. The Fully Refundable Security deposit is not due until Check In. The living room/kitchenette has a new love seat & 46" Smart TV. This cottage is conveniently and uniquely tucked away to ensure a quiet private vacation experience. *4 Spacious Rooms/ 2 separate rooms for sleeping options. Bedroom with queen size bed, and the Reading room with full size futon. In addition to living room & kitchen, and dressing room with shower. All spacious and comfortable. *Priced for 2 Guests Only NO Exceptions! *Beach Chairs, umbrella, coolers, for day trips. *Outdoor Patio/Propane (included) Grill/ Wood Fire Pit/Huge private beautifully maintained field to walk and enjoy. GREAT GREAT GUESTS!!!!! Thanks to all of you for making this such a pleasurable experience!!! GREAT For 2 Guests! All pricing is for 2 guests’ maximum. This friendly 1 bedroom with a queen-sized bed, in a spacious master bedroom, also features a new full-size futon in the reading room. The reading room has a separate entrance, and has an interior window that opens to the kitchenette/living area. The reading room leads into the shower/dressing room. There are two large closets, shower, featuring a custom designed dressing area with large mirror and appropriate lighting. The dressing/shower room flows into the charming air-conditioned master bedroom, also freshly painted, with plenty of room and storage. The living/Kitchenette area is right outside the master bedroom. There is a new small bathroom (toilet/sink) tucked in the corner for privacy. The living/kitchenette area is open and bright with cathedral ceilings, a skylight, and a ceiling fan to circulate the fresh Cape Cod Air. There is a 46” flat screen smart TV to enjoy from the NEW comfy loveseat. A drop-leaf kitchen table seats 4 when extended. There is a full-size refrigerator, full size sink, new counters and cabinets, and many small appliances for your convenience. There is not a conventional stove in this unit. A doorway from the living area also opens to the outside and parking. There is a circular driveway that offers the opportunity to boat owner’s easy access and parking for boat trailers, and an attached garage to store your bikes. The patio is tucked behind a flowering herb garden, and offers comfortable patio furniture and a propane gas grill. There is also a newly built fire pit to enjoy, on those summer nights. Around the corner is the newly constructed traditional outdoor Cape Cod Shower. There is a peaceful open field that can be accessed down a groomed path; it’s a wonderfully tranquil little world. There is a bench to sit and watch the wildlife from just outside your door. All linens are included, including beach and bath towels, and beach chairs are available. The beach is right down the street, and there is a wonderful favorite fishing spot just steps from the property. My husband and I have lived our entire adult lives on Cape Cod. As children, we were both fortunate enough to spend summers here as well. We bought this property in 2001, and have enjoyed the wonderful surroundings . We have taken great pleasure in enhancing our gardens creating, enjoying and sharing the peaceful ambience. We highly respect our guests privacy, but we are just a call away for any questions, or suggestions. ALWAYS GOOGLE EARTH THE PROPERTIES YOU ARE LOOKING AT TO GET A FULL APPRECIATION OF THE LOCATION. Private Cottage on 2 Acres of Tranquil Fields and Gardens This spacious 4-room, 1 bedroom cottage immaculately maintained offers the most uniquely private, comfortable, and affordable vacation experience. This friendly 1 bedroom with a queen sized bed, in a spacious master bedroom, also features a new full size futon in the sunroom. The reading room has a separate entrance, and has an interior window that opens to the kitchenette/living area. The reading room leads into the shower/dressing room. There are two large closets, with an indoor shower. There is a custom designed dressing area with storage and appropriate lighting. (there is also an wonderful outdoor shower). The dressing/shower room flows into the charming master bedroom, also freshly painted, with plenty of room and storage. The living/Kitchenette area is right outside the master bedroom. There is a brand new small bathroom (toilet/sink) tucked in the corner for privacy. The living/kitchenette area is open and bright with cathedral ceilings, a skylight, and a ceiling fan to circulate the fresh Cape Cod Air. There is a 46” flat screen TV to enjoy from the comfortable Brown Jordan furnishings. A drop-leaf kitchen table seats 4 when extended. There is a full size refrigerator, full size sink, new counters and cabinets, and many small appliances for your convenience. There is not a conventional stove in this unit. There is a convection/microwave oven as well as an infusion cooktop, and a single countertop electric cooktop. A doorway from the living area also opens to the outside and parking. There is a circular driveway that offers the opportunity to boat owner’s easy access and parking for boat trailers. The new patio is tucked behind a flowering herb garden, and offers new patio furniture and propane gas grill. There is also a great outdoor fire pit to enjoy, on those summer nights. Around the corner is the newly constructed traditional outdoor Cape Cod shower. Shower/Dressing Room and Toilet/Sink (bathroom) Areas are Separate. Designed for Privacy. New Outdoor Shower also available. Bayside Beaches are 1.5 miles from property. 5 minute drive. 25 minute walk. Parking for Two Vehicles. Easy Spacious, Circular Driveway, For Boat Trailer. Inside Storage for Bicycles. There are 2 living areas. 1. Living/Kitchenette, all Inclusive. Open, bright w/CathCeilings, Skylight, Ceiling Fan,Loft. 46” smart tv w/cable. 2. area, prIvate entrance bright, airy comfy futon. There is a Full Size Refrigerator. Two electric stove top burners, 1 electric skillet, convection/microwave oven. Cozy & private in a beautiful position. Good location for exploring Cape Cod. Thanks for choosing the Outback! 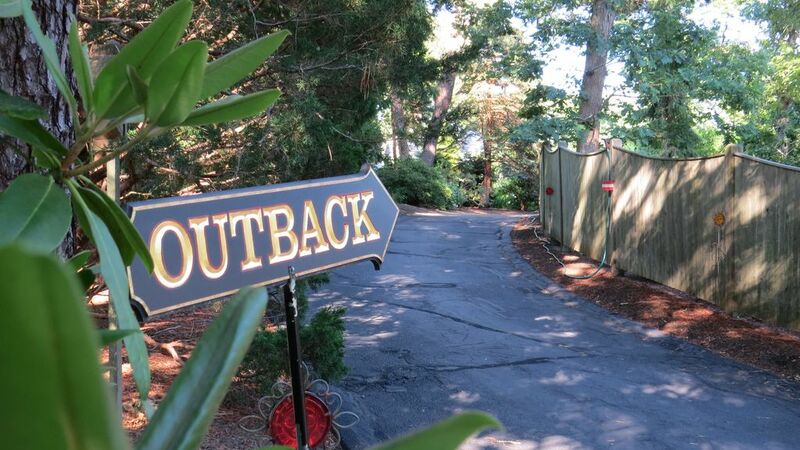 If you want to explore all that Cape Cod has to offer, you can't go wrong with the Outback. It is a cute cottage nestled in a park-like property. And your hosts, Ann and Pete genuinely do all that they can to help their guests feel at home away from home. In addition, they are great tour guides to help you explore all that the Cape has to offer. The cottage is cozy and has all that you might need. The only thing, in my opinion, that keeps this from being a five star experience is the slightly funky layout of the cottage. The kitchenette is a little small and the toilet and sink are in one room with the shower in a completely separate room. But these are only minor inconveniences. Unless you simply have to stay within walking distance of a beach, the cute cottage, its idyllic setting and its wonderful hosts will enhance your experience of Cape Cod. Thank you so much for your wonderful review. We do take great pleasure and pride in our property, and once again have been very fortunate to be able to host such lovely guests. The Cape has so much to offer and we are lucky to be situated in the “perfect spot”, for day trips to anywhere on the Cape, as well as great dining options just minutes away. Our closest beach is just 1.5 miles down the road, so walking may not be a reasonable option, our guests have come up with some clever ideas to be able to enjoy their time on the crystal clear waters of Cape Cod Bay. We are always happy to answer any questions, and to be able to provide our guests with ideas, and an “insiders”, view of the area. We are just a text message away. The design of the cottage is a little non-conventional (funky) 😊�. With that being said, we chose to separate the toilet and sink from the shower/dressing room area, to provide a little more privacy to folks that are more accustomed to a 2 bathroom household. Most 1 bedroom homes offer smaller 1 bathroom facilities. We believe that our design allows one the space for a little pampering in the shower/dressing room, and the toilet and sink in another room to allows more privacy. Thanks again, we are pleased to have been able to offer you the opportunity to enjoy the Cape. We look forward to future visits. My friend and I rented this lovely cottage for a week Cape Cod adventure. Ann, the owner, was gracious and very helpful with any questions. She helped with advise on our day trips which was greatly appreciated. The cottage is delightful! It is just perfect for two and is situated in a beautiful setting. The grounds are very private and beautifully maintained. We had fresh flowers on the counters upon arrival. The cottage had everything we needed for our stay and lots of extras that Ann thoughtfully left for renters. The outside had a flagstone path leading to the firepit, the outdoor patio seating and an outdoor shower. The inside was immaculate and comfortable. We had a wonderful time and would definitely love to return!! Thanks you Ann and Peter for letting us share your lovely cottage! BEST ADVENTURE!! Thanks so much for such a wonderful review. We are so glad that you chose the Outback with so many other vacation rentals available. We do like to maintain an “invisible presence”, and to be available to our guests “as needed”. You girls certainly took full advantage of all this area has to offer. Nantucket, MV, Ptown, Boston, Chatham. Great bucket list! We are so fortunate to be so centrally located that all these wonderful experiences are so accessible. Thank you again, we are very happy you enjoyed your yard, and were comfortable in the cottage. Being here during that summer heat spell, it was nice to know that the “reading room”, the additional sleeping room (futon), was comfortable, and a big thanks for leaving the cottage so clean, it’s so nice to be able to allow our guests, the option of a cleaning fee. Peter and I hope to see you both again, vacations are important, and you ladies were very fun to host. We are very lucky to have had such wonderful wonderful guests. We will think of you both every time the Rose of Sharon (red heart), is in bloom. Hope to see you next year! Quiet and comfy. Perfect location from where you can explore the Cape. The owners, Ann and Pete , are more than willing to share their love and knowledge of the Cape with you. Perfect for the single traveler or a couple. Check out the Lost Dog Pub for good times and Sea Street Beach is 1.5 miles down the road. First time using VRBO and I hit a homer! We are so glad you had such a great experience at the Outback. You were a pleasure to host. Your enthusiasm and love of the area make this an enjoyable experience for us as well. Have a great winter, we look forward to seeing you next season. . Wonderful setting....with private area on the property of terrific hosts Ann & Peter. Much thought went behind the accommodations and landscaping to create a secluded , relaxing atmosphere. I would definitely consider renting again on our next Cape Cod vacation. Close to the beach and places to eat. We spent much of our time bicycling the miles of paths and stopping at the nearby towns. Also worth a trip to Provincetown for a day with stops at lighthouses along the way.. Thanks so much for choosing to stay at the Outback. We are so glad that you guys had such a great time. There are so many places to choose from on the Cape, but as you discovered, the location is great. I'm glad you enjoyed the Outback, it's like it's own little world. We are very fortunate to have you as guests, and we look forward to seeing you next summer! My husband and I enjoyed the cozy cottage, and beautiful surroundings. The setting is amazingly peaceful, and just what we needed for a relaxing vacation in the Cape. Ann and Peter were excellent hosts. We will be back! We are so glad that you chose to spend your vacation at the Outback. We are very fortunate to be able to share the cottage with such wonderful people. We look forward to seeing you soon. Enjoy the rest of your summer. Thanks again. We are conveniently located just minutes from the beautiful bay beaches, and some wonderful restaurants. There is plenty of great shopping, from local artisans, to specialty shops to flea markets. There are fun and informative museums. There is some amazing theater right around the corner. There are remarkable kayaking spots, trails to explore and whale/seal watch excursions are a short drive away. Cape Cod Bay is minutes away. This property is designed and priced for 2 person occupancy. The Maximium number of guests is 2. No exceptions.